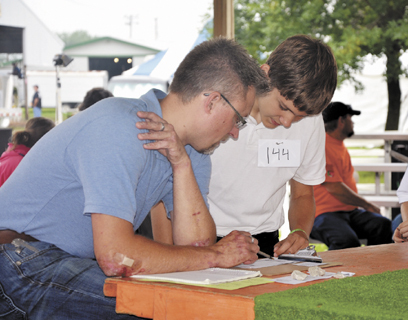 Judge Mark Lange (left) asks Ben Fisher, a member of the Starlight Riders 4-H Club, about his poultry project during the showmanship competition at this year’s Madison County Fair. Due to preventative measures related to the avian flu, no actual poultry animals were allowed on the fairgrounds. Fisher competed in the 14-year-old class. Changes to poultry shows ruffled some feathers at this year’s fair, but for the sake of their birds, youth exhibitors adjusted to what they hope is a temporary format. Prior to the 2015 fair season, the Ohio Department of Agriculture banned all live bird exhibitions for the year to prevent any possible spread of the avian flu, an extremely contagious virus that affects domestic poultry. To date, the virus has not been detected in any birds in Ohio, and the ODA wants to keep it that way. Fair organizers came up with alter-natives that allowed poultry exhibitors to still take part in the fair. Prior to fair week, 4-H club advisors made home visits to verify that exhibitors still possessed their project birds. Then, for the fair, instead of showing their actual animals, exhibitors created posters featuring photos of and information about their animals. They were judged on their posters and went through the showman-ship questioning as usual, just without their birds by their sides. The situation also served as a broader life lesson. “When the kids were upset, I told them that 4-H and the fair is a learning experience. Not everything is fair, and sometimes you have to back up, make adjustments and put your focus in another place,” Robinette said. Poultry exhibitors were eligible to compete for the premier exhibitor title, but could not compete in the Grand Showman of Showmen contest or for grand champion or grand champion reserve titles. Robinette said about a half-dozen exhibitors scratched, opting not to take part in the fair. A total of 79 projects were checked in, which she said is pretty much in line with numbers from recent years. She said she is not worried that the format adjustments will drive down participation. The Madison County Fair’s livestock auction, which takes place on the last day of the fair, is where youth exhibitors earn a premium on top of the going market price for their animals. While this year’s poultry exhibitors could not sell their actual animals through the fair’s market packer, poultry project organizers arranged for another packer to buy the birds the day after the fair. “We contacted a packer who was willing to buy them…giving the kids market price based on how the birds looked,” Robinette said. It remains to be seen if the ban on live poultry exhibitions will continue into next year’s fair season.